To provide the lowest cost and highest performance we developed our own SCSI chips. The first one was the 900 chip we developed with Seagate in 1986. During Al’s tenure we also developed the TMC-950 completed in 1989 and the TMC-1800 chip completed in 1990. The 1800 chip, which supported the 16 bit AT and MCA bus, had several design flaws that required hardware and software to work around. As a result it lacked the compatibility of the 8 bit chip. In 1991 when I relieved Al as VP of engineering he was working on a higher performance 8 bit chip, the 950A, the 1800A chip that fixed the problems with the 1800 and supported 16 bit AT, MCA, EISA, and the 18C50 chip. I canceled the 950A and replaced it with the 9C50 cost reduction. I canceled the 1800A and replaced it with the 18C50 that supported Fast SCSI and SCSI-2. These chips were delivered at the beginning of 1992 in time for our IBM products that depended on them. Later in 1992 we began working on two new chips. The 36C70 was a 32 bit PCI Fast SCSI-2 chip. Intel introduced the specification for PCI bus in 1992. It was clear to me that system manufacturers had a lot of incentive to drop the old proprietary buses like MCA, EISA,VL and VEISA and standardize on PCI bus, so I wanted to be early in that market. We began sampling the 36C70 in early 1993 and the product was popular with OEM customers. We also began work on the 18C30 in 1992 which was a cost reduced version of the 18C50 chip. It dropped the MCA and EISA interface and was designed to be pin (but not function) compatible with Adaptec’s single chip product. The 18C30 allowed us to build a 16 bit adapter for the cost of an 8 bit adapter so we could maintain the CD-ROM market as 8 bit slots were beginning to disappear. The chip began shipping in mid-1993 and by the end of that year our sixteen bit adapter sales would finally exceed our eight bit sales with similar margins. The 18C30 also supported the PCMCIA interface also known as “credit card” adapters used in notebooks. We co-developed such a product with IBM called the “Home and Away” adapter by IBM and the “SCSI2GO” adapter by us. Bill Gates demonstrated this adapter at Comdex 1994. In early 1994 we began design of the 18PNP300, a new single chip 16 bit AT bus adapter that supported the new Plug and Play technology we helped develop with Intel and Microsoft. We finished the product by the late 1994. A prototype of this product was also demonstrated by Bill Gates at Comdex 1994 during the introduction of Windows 95. 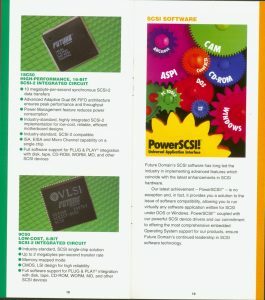 By the end of 1994 our chips were used in several products. The eight bit 9C50 was used on the Creative Labs multimedia sound cards, which caused most sound card manufactures to include it. IBM and Dell also used the 9C50 on the motherboard of systems with SCSI. Our 18C30 was also used by IBM and Dell. One of the most interesting uses of our chips was in the Sony Digital Theater System (DTS), the first digital sound system for the movies. Another interesting application was at NASA, where our chips were used in special data recorders for satellite systems. It became clear by this time that we had reached the end of the line as far as single chip SCSI adapters. New technologies were beginning to be the focus of future development. Three were predominant. Wide SCSI, FiberChannel Architecture, and Serial Storage Architecture by IBM. Late 1994 I was faced with a crossroads. What technology should Future Domain pick?